0.5% basic accuracy Large character LCD Automatic power off Water resistant Drop proof The instrument has basic dc voltage accuracy of 0.5%, a continuity buzzer, a diode check and autopoweroff feature. The automatic poweroff feature automatically turns the instrument off after 10 minutes of nonuse, either from the last use of the selector switch or the last measurement The M5091 has all the capabilities necessary for general purpose testing. It features switch selectable ranges, including five current ranges enabling measurement up to 20 A with a maximum resolution of 0.1 µA, as well as fully specified voltage and resistance measurement parameters. 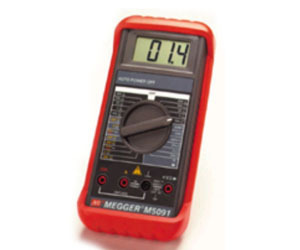 The LCD display on the M5091 features 3 1 /2 digits plus annunciators for polarity, overrange and lowbattery voltage indication. The large display makes reading the instrument in poor lighting conditions much easier.